Inspired by the original expression, Yellow Spot is revived in this Single Pot Still whiskey with a rich complexity and slightly sweet notes. The original Yellow Spot Whiskey disappeared in the late 1960's. Created and sold by Mitchell & Son Fine Wine and Spirit Merchants, Yellow Spot was a 12 years old Irish whiskey that was slightly sweet due to the inclusion of a proportion of whiskey matured in Spanish wine Malaga barrels. Inspired by the original expression, Yellow Spot is revived in this Single Pot Still Whiskey, matured in Bourbon casks, Jerez and Malaga which give its great complexity, with fresh notes and a mild sweetness. This whiskey has been un-chillfiltered to preserve all its flavors. The Malaga wine brings exotic notes and slightly sweetens the whiskey, for a unique tasting experience. 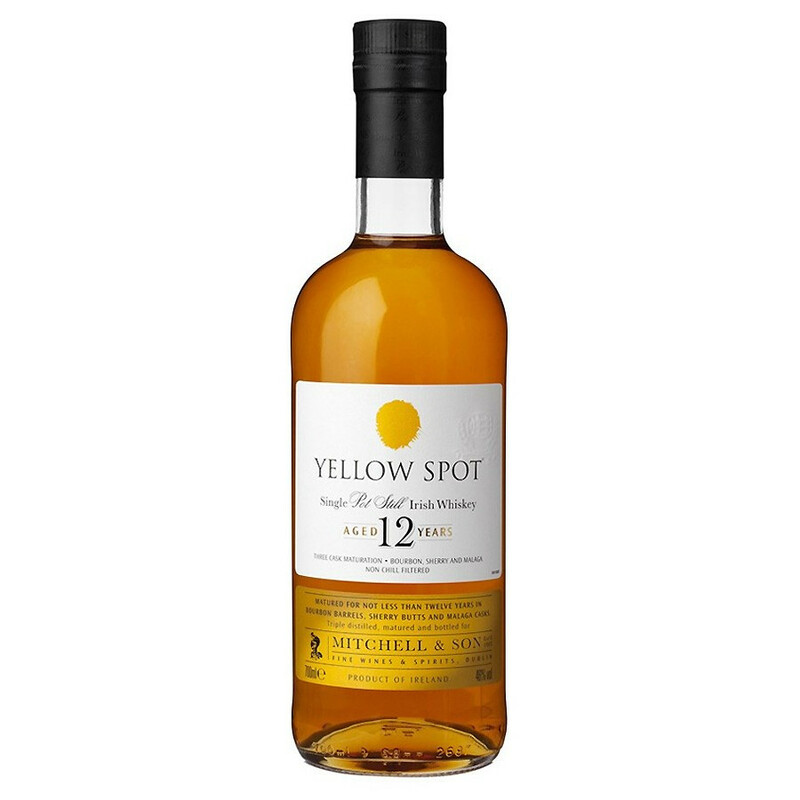 The Yellow Spot's name originally came from the marking used by the Mitchell family, with different colours painted on barrels of different ages. Single Pot Still Whiskey is unique to Ireland in general and especially to the Midleton distillery in the same way that Single Malt is the signature of Scotland. We can consider this name as the quintessential Irish whiskey style. It is made from an equal part of malted barley and unmalted barley in the tradition of Pure Pot Still whiskey, then triple distilled in traditional copper stills that bring complex aromas and a wonderful creamy feeling in the mouth. Nose: mown hay and black pepper. Red peppers, nutmeg, clove oil and green tea. Palate: tasty and spicy. Coffee, milk chocolate and crème brûlée. Red apples and toasted oak. Finish: sophisticated and complex. Long and soft. Red grape must mix with dry barley.